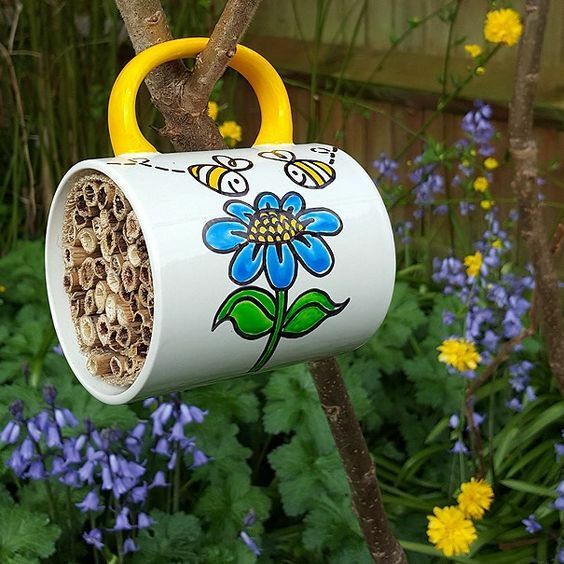 We’ve reached the end of the Wildlife Turst’s #30dayswild nature challenge and feel really proud of ourselves for taking part. 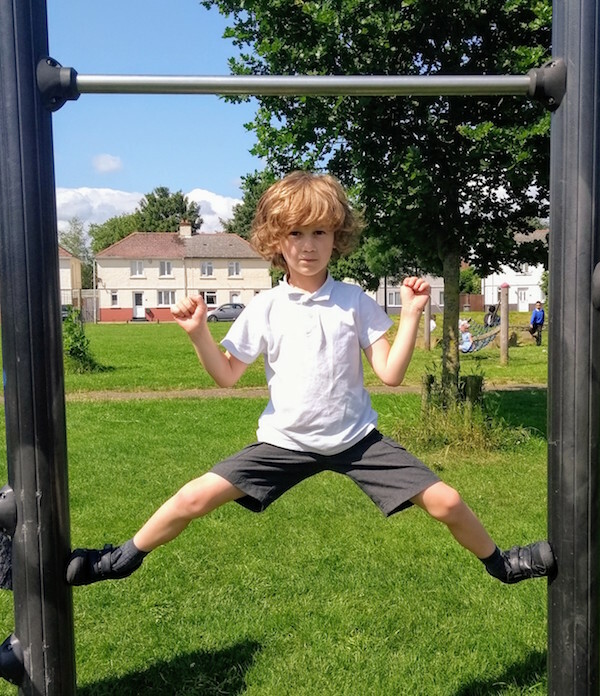 I must admit that in the last week our efforts to fit new activities in around school combined with roasting hot weather were less successful than earlier in the month. We repeated some of our simple activities like taking slow wonder walks and appreciated the ideas given to us by the 30DaysWild app. On the days we felt our activities were a bit mediocre it was a good reminder that every small act like picking up rubbish in the local park, taking our re-usable bottles out with us and having home-made picnic’s outdoors is an important way for kids to feel connected to nature and conscious of the impact their actions have on the world around them. Here’s a summary of our latest acts of wildness as well as one from my wishlist that we didn’t manage this year but want to remember for next year. 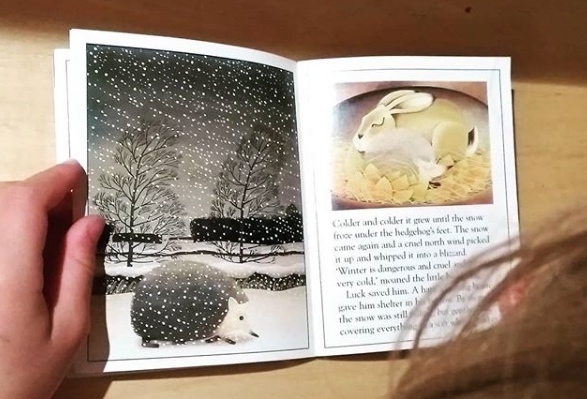 Day 16 – reading one of Euan’s favourite nature stories at bedtime ‘The winter hedgehog’‘. When I said to E we hadn’t really done a random act of wildness today he immediately replied “yes we did, we went outside, we looked at flowers and Luca picked up pine cones on the way to Alfie’s party”. Oh yes! 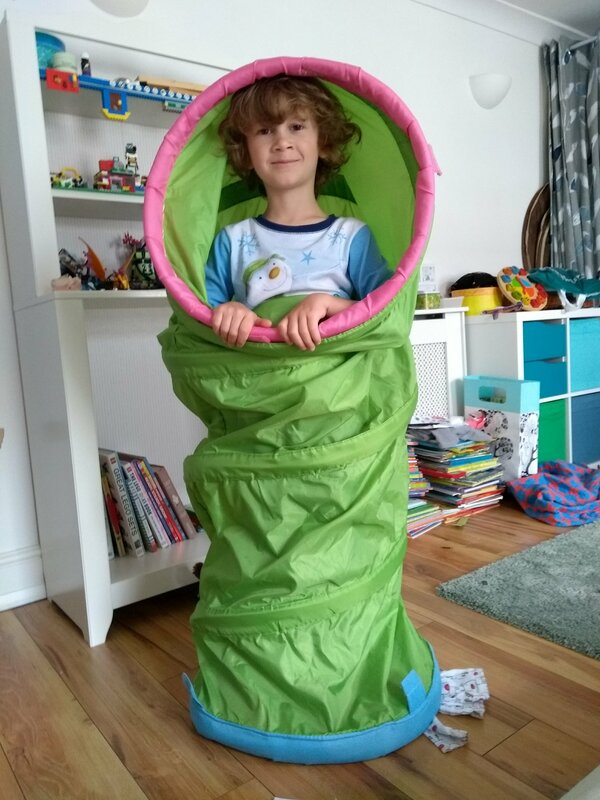 Day 17 – we hadn’t even left the bedroom before Euan had hit upon his first #30dayswild activity for the day – pretending to be Walter the slug from Beatbugs using Luca’s IKEA tunnel! We visited my parents house for Father’s Day as G was working away and the boys had lots of fun playing in the garden with their cousins. Day 18 – both boys were home with coughs and colds so making lunch using wild garlic pesto was about as wild as it got! My friend Sonia made the pesto after reading our blog post about foraging wild garlic in Cranham Woods. Luca and I went to the woods a few weeks later but the wild garlic was past it’s best and I’d forgotten to get the other ingredients needed so I’m claiming the delight of Sonia’s delicious pesto as my own! (and making a note to self for next year to buy hard cheese and olive oil before I go picking). Day 19 – today was Euan’s sports day and the perfect opportunity for lots of drinking from re-usable bottles. As the activities went on for much longer than we anticipated we re-filled Euan’s bottle 3 times for sharing between us and L and I found mint leaves to infuse in it while seeking shade in the school’s peace garden. 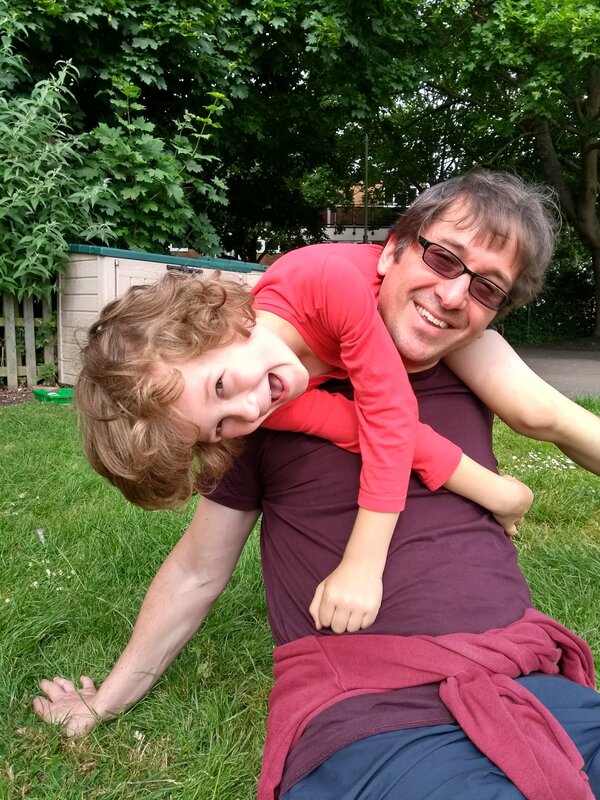 We were too busy keeping cool and following E’s class round the activities for pictures but I did snap one of E’s favourite event – Daddy bundle. 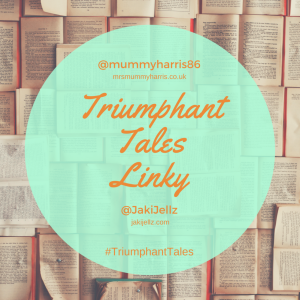 Day 20 – getting up close and personal with a police dog called Napier. 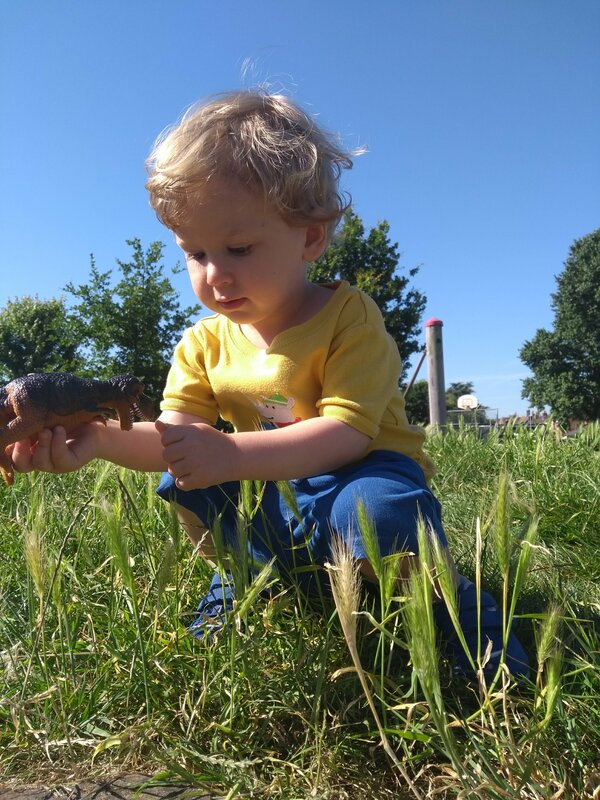 It was a wonderful opportunity for little ones to discover that animals can be more than pets and that police men don’t bite either! 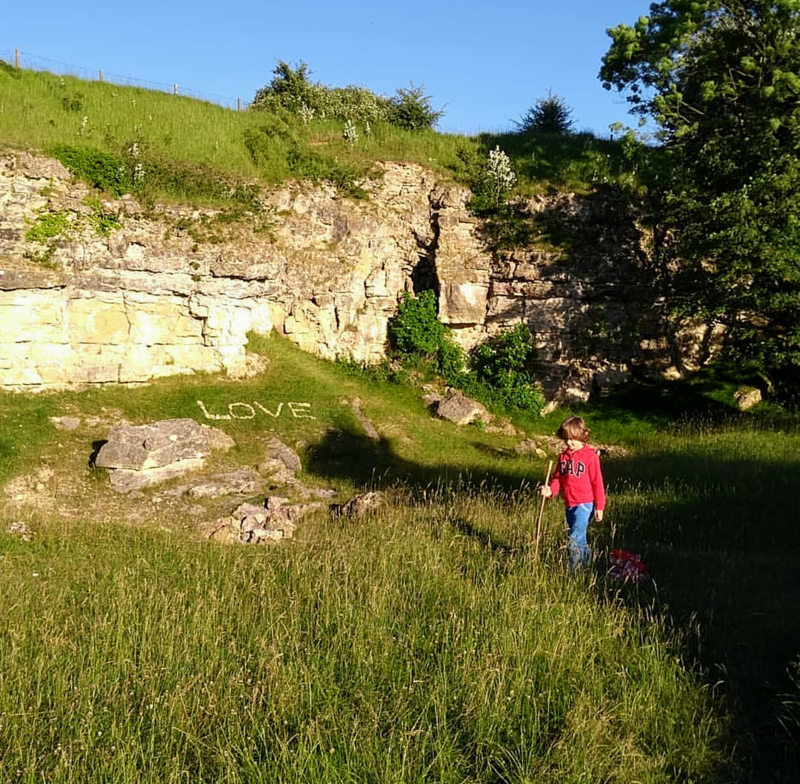 Day 21 – on the longest day of the year, the summer solstice, G and E set off for Selsley Common to recreate E’s rock writing creations from our previous visit. G’s been working on his #SpacesGloucester music project and needed some extra footage for the film to accompany one of the songs. They worked together to produce the word ”LOVE” on the ground with the intention of filming it from the sky using a drone. The skies were a bit too windy in the event but they got some ground level footage and had some wonderful Father and Son time together. Day 24 – after Euan’s swimming lesson we took a walk to Gloucester Cathedral for a celebration day to mark the completion of Project Pilgrim. 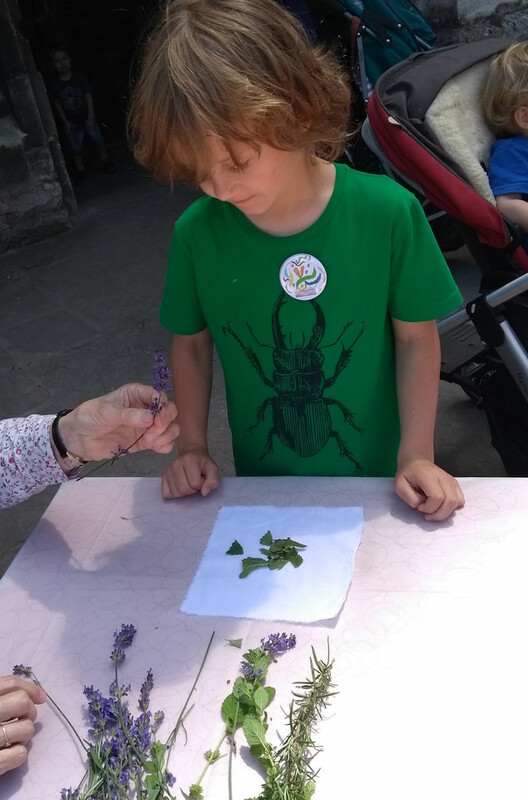 Among the wonderful list of activities E took part in (archery, gargoyle face designing and badge making ) was making a mussy tussy, a posy of herbs and flowers used in medieval times to ward of nasty smells. Euan was able to name the lavender (the bees really like it at the allotment) and rosemary (I’ve eaten Rosemary crackers before) but not sage (It doesn’t smell of anything). Day 28 – visiting Sanford Lido for an outdoor swim. 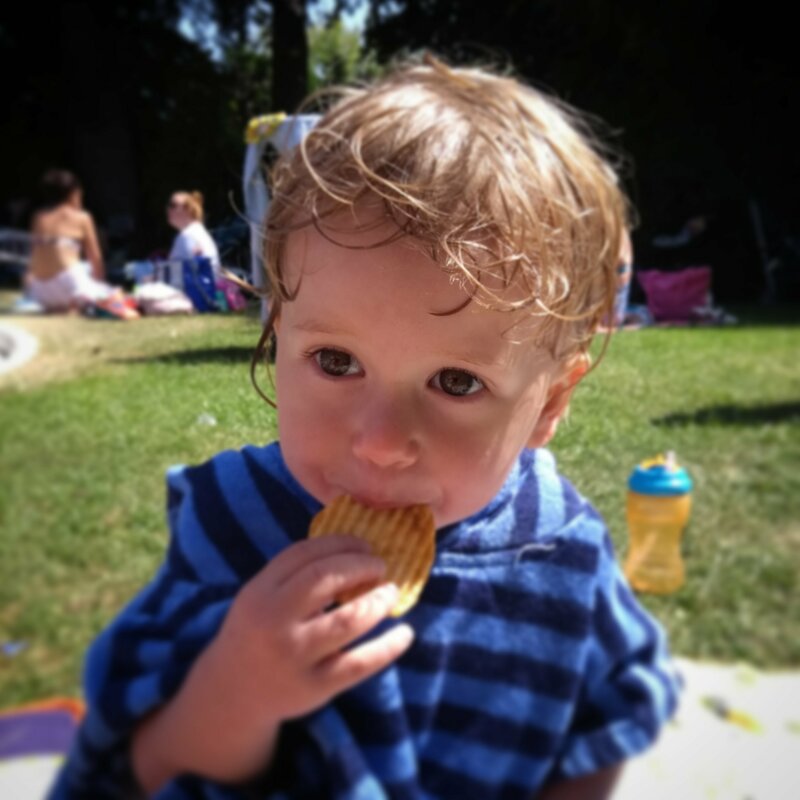 It was so wonderful for Luca who was able to touch the bottom in the kids pool and the combination of sunshine and fresh air as we splashed really gave us the sense of being on holiday. Day 29 – exploring the fabulous new garden area in front of Gloucester Cathedral. 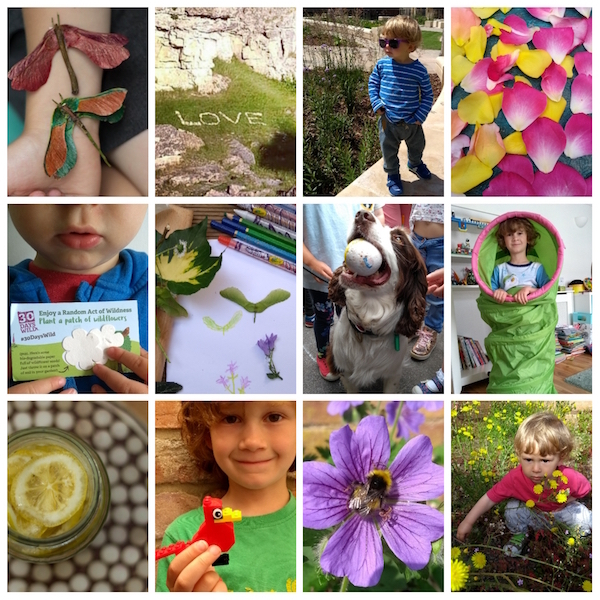 Day 30 – last day and blogging about all our acts of wildness. 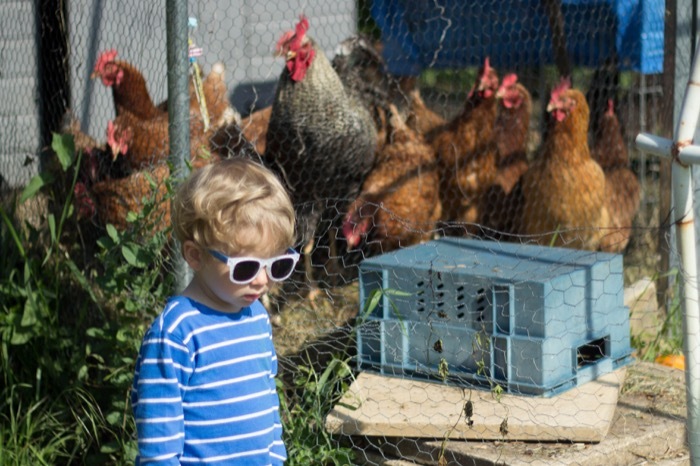 Sharing a random picture of the chickens we say hello to at the allotment every time we visit! If you missed our first 15 days you can read about it here. A big thank you to the Wildlife Trust for hosting the campaign and our local network of officers and volunteers who provide the wonderful activities in Gloucestershire. thanks Siobhan. It’s funny how easy it is to berate yourself for not doing more/better when in actual fact happy faces are all the measure you need! The 30 day wildlife challenge sounds like a wonderful experience for kids. Loved all the photos and dialogue of your child’s adventures. Hi Nic, 30 Days Of Wild is a wonderful thing for children to take part in and you don’t have to live in the countryside to take part. For E to acknowledge that looking at flowers and picking up pinecones are ways of connecting with nature goes to show how much they do take in. Although your two get to connect with nature regularly at the allotment… I do hope your packet of wildflowers flower nicely, I love the packet they come in too, that’s the way we have to go these days or there will be no wildlife and nature left to enjoy!… I love the bee hotel too, bee numbers are declining so anything we can do to help keep them busy and alive is a plus. I have deliberately left some of my basil plants flower as they attract loads of bees. Probably not wise as one bee sting can kill my husband, but they are away from the house and aren’t nasty, they are too busy going about there business to hunt him down!.. 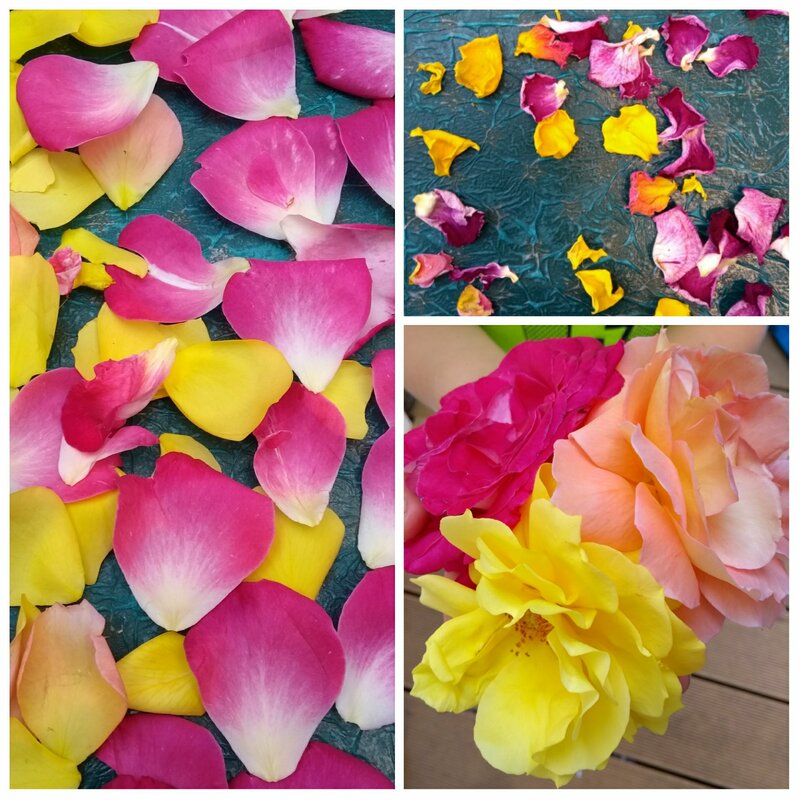 What good use you are making of those unwanted roses, they are so pretty too and someone looks like they are enjoying that crisp after their swim. Sadly I don’t think our flowers have germinated as it’s been too dry. Goodness me, that must be quite something to know a bee sting could be so dangerous for your husband. No wearing purple! That’s a shame. Maybe try again next year a little earlier?… Anaphylactic shock is a big concern. He carries adrenalin shots and we have them in the house and cars. One time he got stung whilst driving, with the children in the car too, he was close to the hospital and drove straight there. Luckily he must have been stung by a wasp (he probably wouldn’t have been able to drive their otherwise), which he has no reaction to. It’s not something we overly worry about as the injection works almost instantly and we feel prepared.